In spite of the hegemony of tablets, ebook readers continue to survive in the modern marketplace. As such, the time is right for another Battle of the ebook readers. Historically, this feature has focused on the latest versions of Barnes and Noble’s Nook and Amazon’s Kindle, the two titans of the ebook reader industry. However, in electronics, as in history, empires rise and fall. 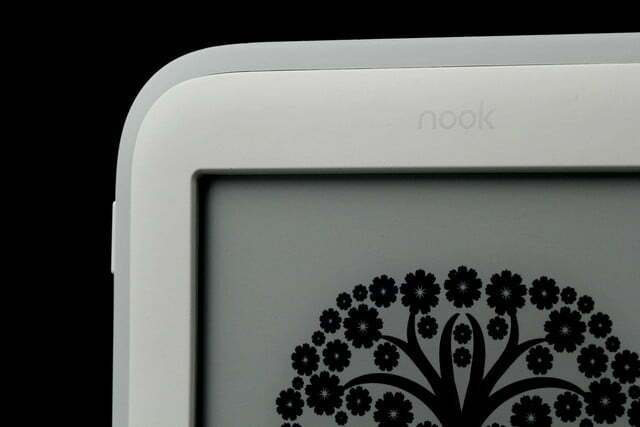 The Nook line has stagnated, while a new competitor, Kobo, has risen with a line of high-quality ebook readers. The time seems right to throw Kobo’s Aura H2O into the mix. So without further ado, let the battle royale begin. All three of our combatants use E Ink, a display technology that uses electronic charges to arrange particles into characters, mimicking the appearance of ink on paper. Unlike LCD displays, E Ink screens reflect light, rather than emitting it. As a result, reading will not strain your eyes in the darkness, and the screen will be visible even in sunlight. The process of arranging particles means that E Ink only uses power when producing an image, unlike other types of screens that constantly use power while they are turned on. Because all three ebook readers use E Ink, the differences come down to screen size and resolution. Both the Kindle Voyage and the Nook have 6-inch screens, while the Kobo Aura H2O goes a little larger with a 6.8-inch display. When it comes to picture quality, the Kindle Voyage is the clear winner. Its 300 ppi (pixels per inch) screen surpasses even the Aura’s superb display. Distinct edges make the Voyage easy to grip. Note the accessible power button. 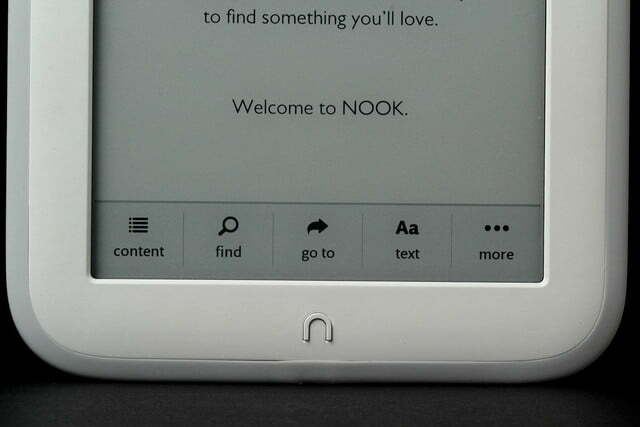 The Nook GlowLight’s design is fairly plain, with a compact form and no buttons. The lack of buttons may seem nice at first — After all, with a touch screen, who needs buttons? However, it can make it difficult to flip through pages say, when you’re holding the Nook with one hand. 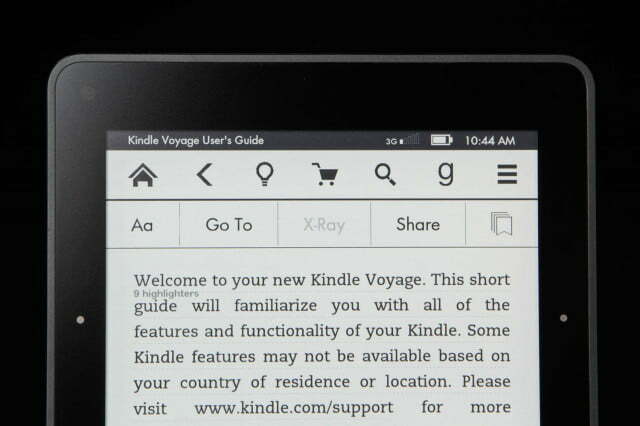 The Kindle Voyage’s buttons allow you to turn the page with a simple press of the thumb. Both the Voyage and the Aura H2O have slick designs, although the bezel on the Aura is more prominent. The power button on the Voyage is located on the back, making it easy to reach for while holding it like a book. Both devices feel good to hold in hand for extended periods of time, and both strive for a seamless design, with the Kindle just slightly edging out the Aura in that regard. The Aura H2O, as its name would suggest, has one feature that neither of the other competitors provide: It’s waterproof. 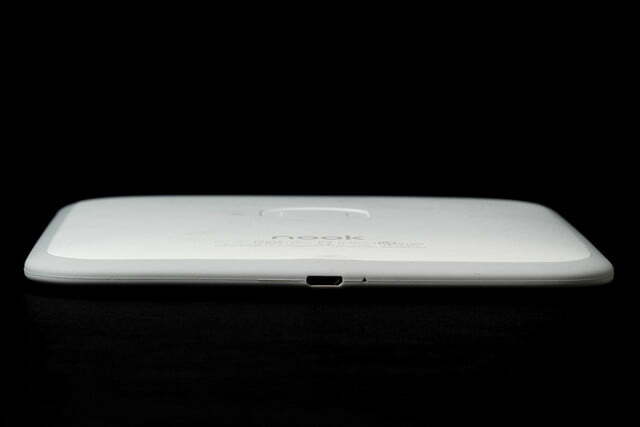 The smooth design of the Aura is completed by a flap that covers the charging port and MicroSD slot. You can take the Aura to the beach or a pool and not have to worry about water or sand ruining the device. Winner: Kindle Voyage, though if you lead an active lifestyle, the Aura H2O will probably serve your needs better. We suppose it comes down to whether you find yourself reading more often in a coffee shop or in the bath. In our last battle of the ebook readers, we noted that that Nook and the Kindle Paperwhite had similar performance, though the Paperwhite came out a bit ahead. While Amazon promises that the Voyage is “20 percent faster,” our review determined there was no noticeable difference between the Voyage and the Paperwhite. The Kobo Aura H2O also seems to perform at the same level. The Voyage could be the most powerful of the three, but they all do what they need to do. The Kindle uses Amazon’s proprietary format, and the DRM on its ebooks is stricter. Amazon’s library of content is vast, and its self-publishing program for ebooks means there are many low-cost ebooks exclusive to its store. Amazon also has a rental program for textbooks, which college students should find useful. Amazon’s cloud servers allow you to easily access and download books you own, without having to store them permanently on your Kindle. The Voyage has 4GB of storage, and it does not have a MicroSD slot. 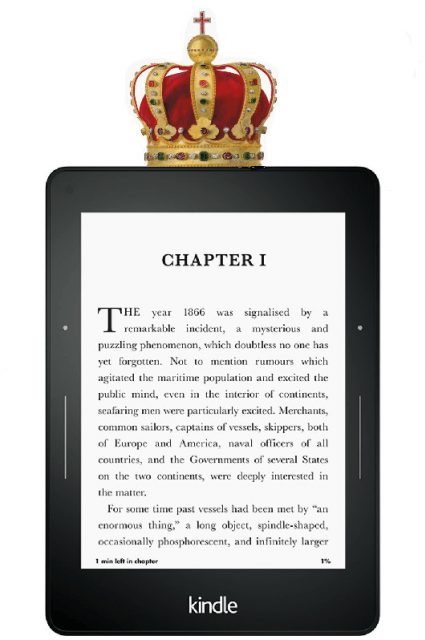 The Nook uses EPUB, a widely adopted, open format. This means you can read ebooks from a variety of storefronts (such as Google or Kobo) on your Nook. Kobo has a store with over 4 million titles available. Books you own are saved to the Kobo cloud, and can be downloaded whenever you want. 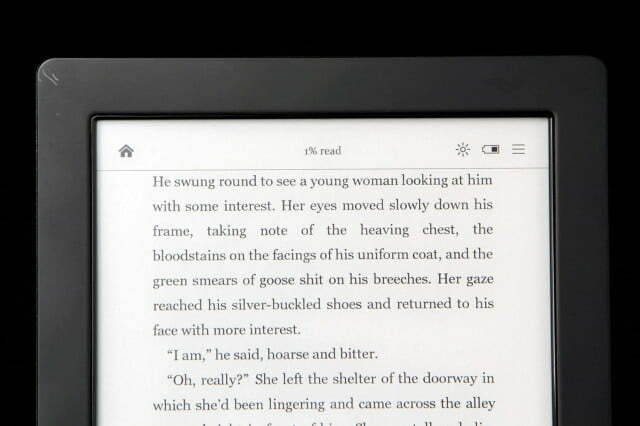 Like the Nook, Kobo also uses more open formats such as EPUB. In addition to the 4GB of memory on the Aura, you can use a MicroSD card to expand up to 32GB. All three of the marketplaces have DRM on their products, although Amazon’s is more restrictive than the other two. All of the ebook readers in this competition include the ability to tap words and look up their definitions, as well as highlighting and annotating passages. 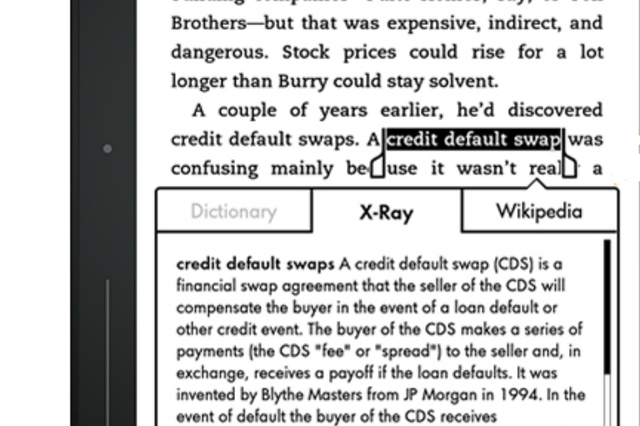 The Kindle Voyage is the most robust in this regard, gathering information from The New Oxford American Dictionary, Wikipedia, and Amazon’s X-Ray tool. Moreover, the Voyage integrates these tools with social media, allowing you to share your notes and highlighted passages on services like Facebook. 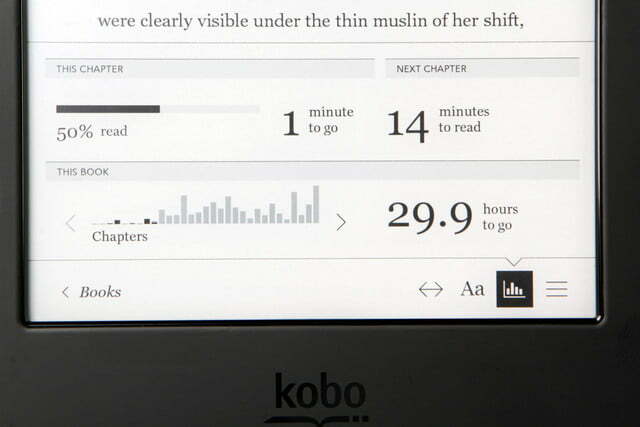 The Aura provides users with reading stats, keeping track of how quickly you read and how long it will likely take you to finish a book. The stats are neat, though hardly essential. Overall, the Voyage provides the most robust package of extra features, though the Aura is no slouch. The Nook is really outdated in this category. Borrowing ebooks from your local library can be a bit of a pain no matter what device you do it on. Both the Nook and Aura H2O require third-party software to facilitate the process. Amazon’s Whispersync service makes things easiest by allowing users to sync ebooks to their Kindle directly from the library’s website. The Voyage’s basic model is $200. This version of the device comes with Wi-Fi connectivity only, and also includes ads. An ad-free device will cost an addition $20, and the ability to connect to 3G will cost an additional $70. So, an “optimal” Voyage will run you about $290. The one area where the GlowLight has improved since last year is the price. At $100, it’s a modest drop from the old price of $120, but that may be enough for people who want to save money. The Aura is $180, making it a little cheaper than even the basic Voyage package, although it doesn’t have the option of upgrading to 3G. Winners: The Kobo Aura sits at the best intersection of value and utility. If you’re on a tight budget, however, the Nook is the safest option. In the last battle of the ebook readers, the Kindle Paperwhite dethroned the Nook. Today, The Kindle Voyage seems capable of holding on to its predecessor’s crown, with a sleek design and a number of little improvements over the Paperwhite. Yet, the Aura presents an attractive option for people turned off by Amazon’s restrictive practices. In many technical aspects, the Aura is on par or close with the Voyage, and waterproofing remains a trump card that no other brand can match. In the final tallying, the Voyage wins by a nose, but the Aura is by all means a viable alternative, especially if you need an ebook reader that can endure the elements. While the Voyage may sit on the throne, the Kobo is only just off to the side, dagger in hand. The biggest takeaway from this competition is not the strength of the Voyage or Aura, but the sad decline of the Nook. While Amazon and Kobo have both continued to improve on ebook reader design, the only thing Barnes and Noble have improved about the Nook is the price.